The job of stay-at-home mom might not come with a salary or a matching 401k, but it does come with a lot of overtime and stress, none the less. Some misinformed people don't realize how hard these women work. Rather than let these uneducated few go on thinking that stay-at-home moms are just sitting on their couches all day, we've decided to bust those myths! Just because Dr. Phil and The View air during daytime hours doesn't mean SAHMs actually have the time to watch these shows. Living in a house with a partner and kids means, among other things, mountains of laundry (because Kimmy MUST have her favorite shirt for tomorrow's pep rally,) contractors to oversee when the internet is out or the plumbing needs fixing, and food to prep for dinner. Betty Draper might have made it seem easy on Mad Men, but, in actuality, many SAHMs find it hard to squeeze in everything that needs to be done! Do stay-at-home moms occasionally take the time to recoup with Dr. Oz? Yes. However, couch surfing just doesn't fit the schedule most of the time--unless they have the ability to freeze time or program their DVR. In all reality, kids are a lot of work. Children sometimes need attention at all hours of the night, so SAHMs are always on the clock. Also, with no extra income coming in, no paid vacation, and a potentially unappreciative spouse, the rewards may not be as apparent in this line of work as they are in a corporate workplace. So, while there are some nice perks that go along with being a SAHM, such as daily quality time with your kids, it's certainly not an "easy" job or one that's fit for the unmotivated. Moms wish they could do it all, but, like at a normal job, there aren't always enough hours in the day to accomplish everything on their 'to do' lists. Even though a mother's love for her children is unending, no one loves their job 100 percent of the time. And that goes for SAHMs as well. Truth be told, while many stay-at-home moms might enjoy their work a lot of the time, it isn't always easy. Some moms may even be itching to go back to a 9-5 job but don't want to leave the kids at daycare. Ultimately, being a SAHM is like any job; you have your good days and your bad. Let's examine Homer Simpson from The Simpsons for a minute. He comes home from work, grabs a beer (or six,) and then parks himself in front of the TV (if he's not heading to Moe's to be with the guys, that is.) Yet, Marge, his patient, stay-at-home wife just lets it go and never says a word. Why on earth would she deal with that? Not to mention, where's her group of friends? 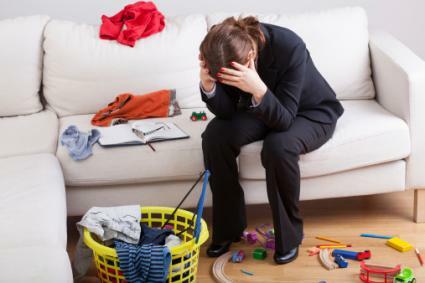 While women tend to do more housework than men in general, being a SAHM isn't the equivalent to being a full-time maid, and many couples come to the conclusion that keeping up the house is every family member's responsibility. Putting in a day at school or work isn't an excuse for the non-stay-at-home parent to not pitch in and do his part. Many believe that a stay-at-home mom doesn't leave the house at all. The home is her office, right? EVERY mom is a Debra Barone from Everybody Loves Raymond and doesn't want to leave, right?! Wrong. Despite moms having their homes as their work bases, many tasks that keep the home running require them to get out and about during the day. Heck, just driving to the store can take 15 minutes, let alone picking up the dry-cleaning or taking the kids to the doctor's office. How does the Barone family have a constant supply of food? How do the kids get to their activities? TV magic, that's how. If a stay-at-home mom wasn't taking on the majority of the housework, she'd also be bringing in a monetary income too. However, many SAHMs might feel discounted for their work or not entitled to spend the joint household income. Lucy Ricardo always has "some 'splainin'" to do when she buys a new outfit. But it's her money too! Marriage is teamwork, and the mentality of "me" should be "we." A stay-at-home mom has just as much claim and ownership of that money as her husband because she is doing her job to make his career as stress-free as possible. A hot meal after work doesn't make itself. Lucy, be proud of your collection of hats! You've earned them with no 'splainin' needed! A stay at home mom's job never ends. Imagine if all the kids were exposed to the Chickenpox at the same time, or Jimmy is in need of a major heart-to-heart after a life-shattering day. Stress does manifest. It's a fact. But stay-at-home moms are the masters of coming up with creative ways of navigating these situations. Many times, the family doesn't even notice the magic she just performed. Everyone feels safe and nurtured because of Mom's loving care. Because a stay-at-home mom dedicates her time to the family, it doesn't always mean she's obnoxiously poking around everyone's business. Sure, she might take on the role of manager of the house, but she also realizes that people need their space. Take TV's Roseanne Conner, for example; she's loud, domineering, and bossy--yikes. Who would be able to live under her roof? Stay-at-home moms are domestic engineers--they know the ins and outs of their household and every family member like the back of their hand. Alright, maybe mopping isn't the most thrilling task on the planet, but receiving a big bear hug for helping Timmy with his science project is. Edith Bunker seems to always get the shaft. Archie is a tough person to live with, to say the least. How does she keep her cool with the lack of perks? There might be a lot of rumors about what a SAHM actually does, but they definitely aren't pulling tactics from the playbooks of TV moms or looking for a pat on the back. It can be a tough job, but a stay-at-mom is up to the challenge!